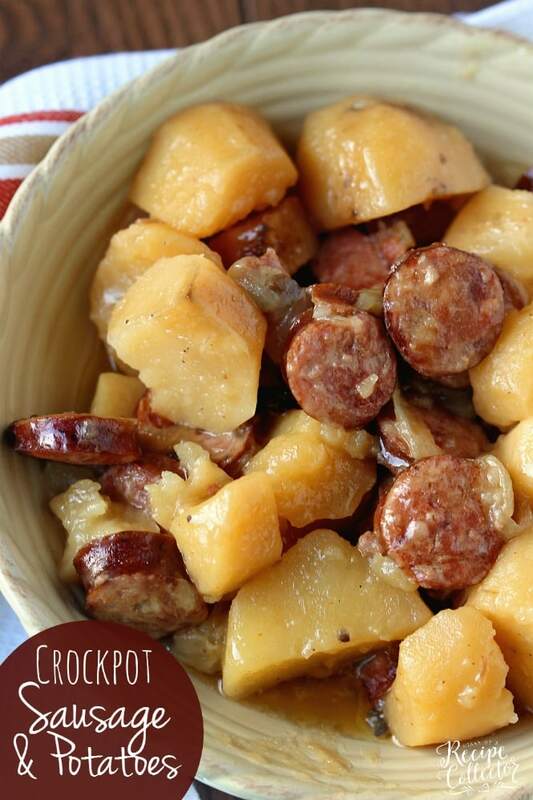 Crockpot Sausage & Potatoes is such an easy dinner idea with only five ingredients! Plus it will leave your house smelling amazing as it cooks all day! Hope you are having a wonderful start to your week! 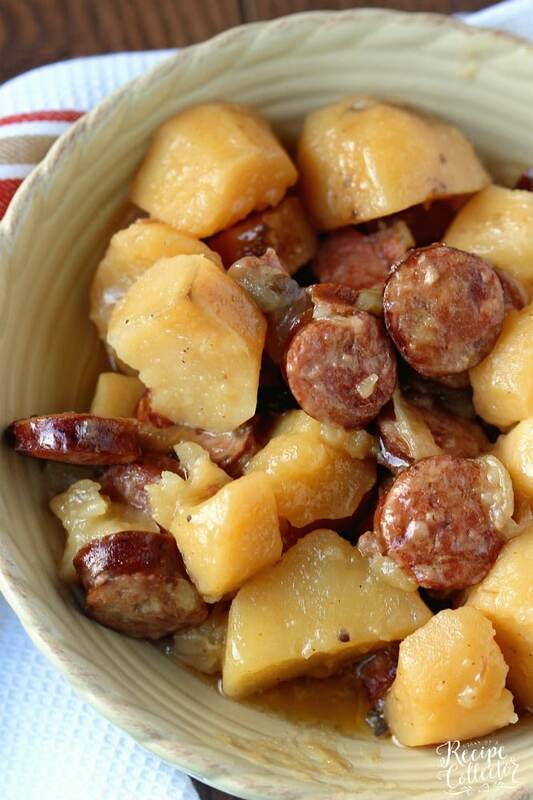 And today I have brought you a wonderful weeknight (or any night for that matter) Crockpot Sausage & Potatoes dinner idea. And I know you guys like this kind of recipe too! So I couldn’t wait to share it with you! It’s the kind of dish that is perfect for the busy week we will be having especially after an incredibly busy weekend too. On Saturday, my oldest daughter had a cheer competition in Houston. Basically that boils down to a “hurry up and wait” kind of day. But on a good note, this was a same-day, drive in competition, which is so nice! Most of the time, we are gone the whole weekend when we have one. So after being gone a lot lately, I am craving this supper again. It’s made with only FIVE ingredients that I usually always have too! I love those kind of recipes. We used our favorite smoked pork sausage, but you could use whatever kind you like best. And as with most sausage dishes that simmer away all day, it smells AH-MAZ-ING! And tell me I am not the only person that feels so organized and prepared when I have something cooking in my slow cooker? Surely not! I love that feeling of knowing supper is done!! And here lately we stay so busy all week, just about everyday is a good day for the crockpot! We served these sausage and potatoes with corn-on-the-cob, which my kids LOVE! Nothing better to these Louisiana folks than sausage, corn, and potatoes! Hope you’ll try it soon! Place all ingredients in crockpot. Stir. *Use a slow cooker liner for easy clean up! You can find these with the plastic storage bags in the grocery store. This looks GREAT! I am so with you, I feel so organized when I think ahead and make a crock pot meal! Hi Kimberly! There is no need to add water to the recipe. The crockpot does its magic without it! Thanks for visiting! Have this in my slow cooker now and had to do a taste test. So so good! Can’t wait to try more of your recipes! Hi Sarah! Hope you loved it! Thanks for visiting! Does putting the sausages in raw cause the rest to get very greasy and soggy. Should I cook sausage before? Hi Mel! No, the sausages cook up perfectly! With little exception, all smoked sausages are fully cooked already. All one has to do is to add them to any recipe and let them heat up with the food that’s actually cooking. Browning them, usually sliced, for recipes outside of a slow cooker one, is nice because the meat gets all crispy, which just adds to its excellent flavor. Thank you Jaren for the recipe. You’re very welcome Liz! Thanks for visiting! Hi Jamie! No, I would not say it is spicy unless you use a spicy sausage. We are very accustomed to creole seasoning in my house, but you can always use salt and pepper. Totally making this soon!! It really caught my eye! Do you add any water since you use the cream soup? Hi LouAnn! No I did not add any water, but with the magic of the slow cooker, the dish cooks down, and it is not needed. I did not find it salty, but if you are worried about that, you can use a low-sodium version of the cream soup. Thanks for visiting!! Do you think you could substitute the russet potatoes for red potatoes (I have those on hand)? Also, can you use turkey kielbasa instead of pork sausage? Thanks! Hi Lindzee! Yes, I think both of those would work fine! Thanks for visiting! I have an allergy to mushrooms. Can you think of another cream of soup that would do well? I worry celery won’t have enough flavor. I actually like cream of celery and think it would work fine for this recipe. The smoked sausage already gives the dish so much flavor too. The other cream soup I like to use is cream of chicken. Thanks for visiting Rob! Hi Jaren! This looks delicious. I plan to make this during the week, but I was just wondering if you could cook it on High to cut back some of the time? Would you think it being on High for 3-4 hours would be okay? Hi Ciera! Usually cooking on high cuts the time in half, so I would say that would work just fine!! We love it and hope you do too! Thanks for visiting!! This looks delicious and I want to try making it this week. The only hang up is that I don’t have Creole seasoning. What would be a good substitute? Thanks! Hi Katherine! You could just season with salt and pepper or seasoned salt. Creole seasoning is a little different in that it has some red pepper, garlic powder, and onion powder in addition to the salt. But again, salt and pepper will work just fine too! Thanks for visiting! Is there anything to substitute the cream of mushroom with? I try to cut dairy products out when cooking. Thanks! Hi Laci! I think you could leave it out of the recipe, and it would come out fine. Thanks for visiting! I’m really late to this party… but a good substitute for creamed soups is a can of french onion or beef consomme with about 1/2-3/4 of a pack of packaged gravy mixed in. You can use the whole package.depending on how thick you want it . The liquid from the onions is going to thin it down as well. This is a pretty late reply, but be careful of which French onion or Beef consommé soups you use because they typically have dairy products in them. I’m going to try leaving out the cream of mushroom soup and adding a little olive oil. I made this for dinner last night and my roommate and I both really enjoyed it. I substituted Cream of Celery instead of Cream of Mushroom (my roommate despises mushrooms), as mentioned in a previous comment. I also decided to brown the sausage (2 12-oz Hillshire Farms smoked sausages), and was able to do that while peeling and cutting the potatoes and onions so it didn’t really add any more time to the preparation… believe me, browning the sausage first really brought out the flavor. You should try it next time. Thanks for the amazing recipe, and I will definitely be checking out a lot of your other recipes. (p.s. I was born in New Orleans but currently living in WA state, and roommate was born in WA and never left. It’s always fun to show off “home flavors” to roommate and friends who have very little exposure beyond gumbo and jambalaya… and those only because they come in boxes or cans). Hi Richard! Thanks for sharing! Very glad you could share some good southern comfort food with your roomie! Hey do think adding green beans would be ok? Hi Jasmine! Yes, I think that would be a great addition!! Can you add cabbage to this recipe? Hi! I think cabbage would be fine. Add it towards the end of cooking time (maybe the last hour or so). Thanks for visiting! Hi Betsy! It is supposed to be raw. Thanks for visiting!! Hi Agatha! It is smoked, but it is not fully cooked. I think your sausage would work. I wouldn’t use a summer sausage for example. That is ready to slice and eat. Most sausage in the meat section of the grocery store is smoked, but needs further preparation to bring out flavor in the dish. Thanks for visiting! Can you please tell me what brand of sausage you used? The only kind I can think of is Hillshire farm kielbasa. What you have in your picture looks better than that! Thanks! Hi Teri! Down south we can find smoked pork sausage easily. They are mostly local/regional brands like Richard’s and Savoie’s. But I think you can find other brands too depending on your location. If you have trouble, try asking at the meat counter for help. I don’t usually buy Hillshire Farm for a dish like this. Have you ever added mexi Rice? Do you think I should put it in at the beginning or wait til it’s already been cooking awhile? Hi Heather! 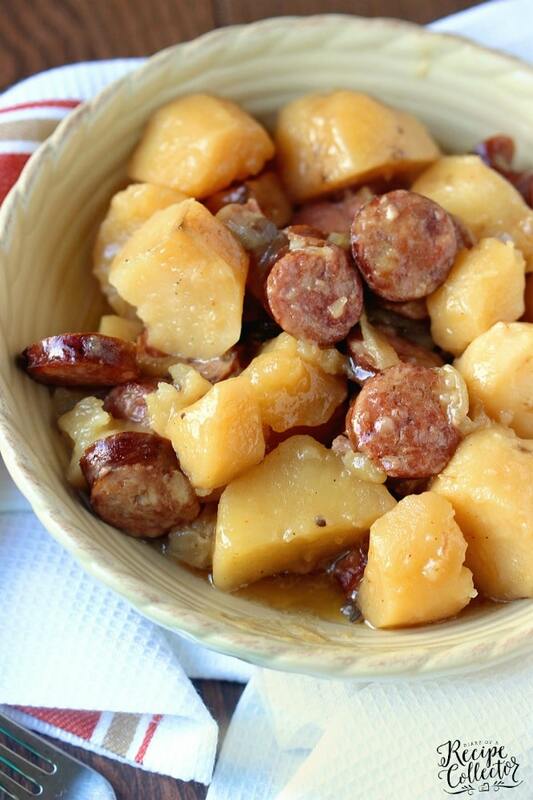 I have not added Mexi Rice to the Sausage & Potatoes recipe because it already has a starch. I would wait until it’s already been cooking a while before adding it though. Thanks for visiting! How many servings does this recipe make? I am a family of 8 and need to know if I should double the recipe. Ezt Magyarországon mi a tetejére sajtot reszelünk és tejföllel le öntjük ,és úgy sütjük a sütőben ! Can you put frozen corn in with this? Hi Susan! Yes, you sure can! Have you ever tried Italian sausage? Think it would be ok? This looks delicious. Hi Ginny! I haven’t tried Italian sausage. I do think it would change the flavor of the dish versus using a regular smoked sausage. Let me know how it goes if you try it! I’m about to find out. It’s in the crock pot now! Hope you loved it Brenda! About how many potatoes do you use and wouldn’t you have to cut them up smaller than the picture to make sure they cook? Hi Candy! I don’t get very precise on how many I use exactly. I buy a 5 lb. bag and use about 1/2 the bag (2.5 lbs.) I promise they will cook down. As you can see from my photo, it looks like a few of them broke up as I scooped them into the bowl. Thanks for visiting! I have about 3-4 slices of bacon leftover from a previous recipe. We’ve made those before and loved it. Was curious on your input of adding it and if you feel cooking it before to crisp if up and bring out that bacon saltiness would be more ideal than cooking it in the crockpot? Hi Miranda. I’d say I would cook it beforehand too. I think the texture would be better that way. Thanks for visiting! Hello! What size slow cooker/crock pot did you use for this recipe? I have a very large crock pot and just want to be sure of proportions and/or how much I have to increase the amounts. I cant wait to make this — it looks amazing!!! Hi Bill! I have a 6 qt. slow cooker. Hope you enjoy! Thanks Jaren! Another question — I have raw sausage from the butcher — Suggestions on preparing it before adding it to the slow cooker? Should I partially cook them beforehand? Do you think it would be ok to throw it all in a freezer bag and then just dump in the crockpot the day you want to make it? Trying to do some meal preps and this looks amazing. Hi Courtney! I love the idea of doing this, but I have not tried it with raw potatoes. I’m honestly not sure how they would hold up in the freezer. Thanks for visiting! Have you ever tried egg noodles and put the recipe on top the noodles? Hi Liz! No I have not tried that, but I sure do love egg noodles! AT first I thought kielbasa and mushroom soup doesn’t sound right. Let me say I was wrong and this works. I doubled up the potato, onion and soup to have more servings. all I can say is Wow. Hi Arthur! Glad to know it works with kielbasa well too! Thanks for visiting! I am trying this for the first time! I will update on how it turned out. I put half of a red bell pepper that I had leftover and sliced roasted corn from the cob. The creole seasoning is a staple in my house even though I am a born Yankee. Hi Vicki! Those both sound like wonderful additions!! And isn’t creole seasoning the best! Couldn’t live without it over here! Yes Creole seasoning is a heaven sent! Anyways this recipe turned out great! It was so favorful additional seasoni was needed afterwards. I also made biscuits to collect all the deicious flavoir left in the bowl! This is definitely keeper! Made this last night for supper and it was a huge hit! I only had a few potatoes so I added a bunch of radishes and a few carrots. I also didn’t have creole seasoning so I added a bit of dry ranch dip mix. It was delicious! I will definitely be making this again! Thanks! Hi Naomi! I love how you used up what you had on hand!! And that ranch idea has definitely got me thinking now!! Thanks for visiting! Hi Sarah! I’ve never cooked keilbasa before, so I am not sure about the flavor. I do believe someone has commented on using that on this post. Yes, you can leave the onions out. Thanks for visiting! Hi Sarah! Just curious as to how it came out with the kielbasa? Thanks! Hi Sheila! That’s how my good friend makes it too! Sausage pretty much any way is always a good idea! Thanks for visiting! It was my second time making this recipe. I had some boneless pork chops to use up. I cut them in stew size chunks and substituted it for the smoked sausage. Outstanding is an under statement..
Oh what an awesome idea! Thanks so much for sharing!! I made this for dinner tonight and it is wonderful. Super easy and delicious. Would make a great weeknight dinner. We love this one too! Thanks Jessica! Is cereol spicy? I have and 8 and 1 year old and just wanting to know ahead of time. Hi Becca! It can be spicy if it is something you don’t regularly use. It does have red pepper in it. We have it in everything down here in Louisiana, so it kind of feels like something is missing if we don’t use it 🙂 Don’t go out and buy it if you are unsure. Just use salt and pepper. I’d probably go with 3/4 tsp salt and 1/2 tsp pepper, and you can always season more when it’s finished, if needed. Thanks so much for your question! Have a great night!! did anyone add mixed veggies in this? Hi Tracy! You could certainly add whatever mixed vegetables you’d like. I think some frozen green beans would be great! Thanks for visiting! Could this be done in the oven? If so what temp and how long do you think? Hi Ashlyn! 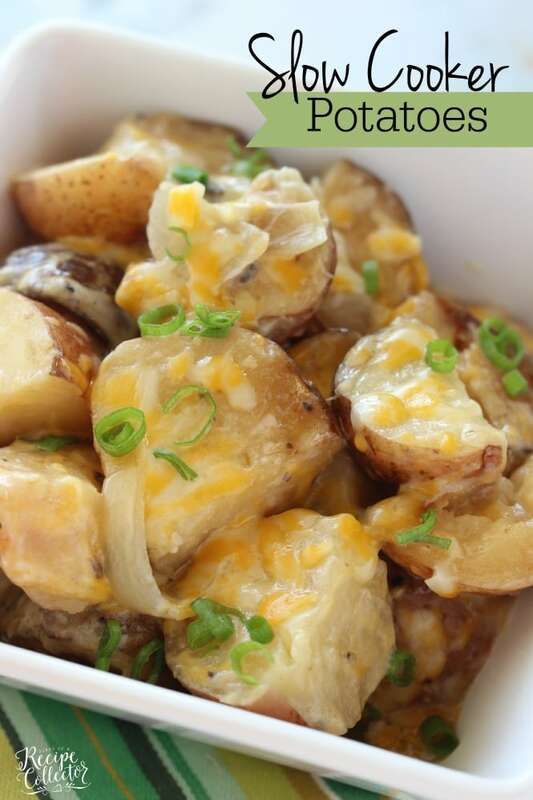 Yes, you can make this in the oven too 🙂 I have a similar recipe for French Onion Oven Potatoes (https://www.diaryofarecipecollector.com/french-onion-oven-potatoes.html ) I bake them at 350 for about an hour, so you could try to do it like that! I bet it will be delicious!! I’m wondering if you can use condensed cheddar cheese soup instead of cream if mushroom? I have not cooked a lot with cheddar cheese soup, so I cannot be sure as to how it would turn out. But I do love cheesy potatoes, so it is worth a try! Trying it with cheddar cheese soup right now. Also using Yukon gold potatoes as those are the one I bought this time. I’ve made it using the original version and the family loved it, so changing it up a bit. I’ll let you know how it goes. That sounds really good Christine! It turned out great. Even my potato hating sister loved it. I even added to my weight watcher recipe builder so I could track it. I’m so glad to hear it!! I must try that now! I’ve never had potatoes in the crockpot before. Do you put them in raw? I made this for dinner tonight for the 4 guys that watch sports at my house . I doubled the recipe and thought “jeez that is a lot of food!” Guess what?? ALL GONE!! Everyone was ranting! 1 guy said “please teach my wife to cook cuz you rock” My boyfriend just sat back and smiled! Thank you for this recipe! It was AMAZING!! Hi Stacy!! So glad everyone loved it! I love how easy it is to make too!! Thanks for letting me know!! There is only one thing wrong with this recipe: It’s so delicious that you eat way too much!! I made it tonight and several hours later, I’m still full. 🙂 I followed the suggestion of another person and browned the sausage before putting it in the crockpot. I also used cream of celery soup and I think I like that better than mushroom. I didn’t have creole spices so I just used garlic powder and Mrs. Dash. About 45 minutes before eating I added some fresh green beans for color and they provided good texture and taste. It’s just the two of us, so I have plenty for leftovers. This is a wonderful recipe; it’s easy to make and very tasty. Thanks so much for sharing! I’ll definitely make it again! I love cream of celery too! I haven’t tried it in this recipe, but now I need to do that and the green beans!! Thanks for sharing!! Could you cook on high 4-5 hrs instead of on low for 8? Hi Lindsay! Yes, I think that would work! I haven’t tried it on high, but that typically cuts the cooking time in half. Thanks for visiting! Newbie with the crock pot. In your opinion, would using raw sausage and not smoked sausage be ok? I only use smoked sausage. This dish is really good because of that smoked flavor, so I wouldn’t skip out on that part. Thanks for your comment!! Can you tell me the number of servings the sausage & potatoes yields. I would like to make it for my staff on Halloween, our favorite autumn celebration and I’m the cook. This seems perfect! Hi Tina! One recipe feeds about 6 to 8 people. You can certainly double it in one crockpot. I would use a second crockpot if you needed more than that. Enjoy!! One of my nieces posted your recipe. My husband loves all of the ingredients, so I’m sure he’ll like it! I am trying this today! I don’t have creole seasoning on hand, so I looked it up on line and found a spice mix suggested to make your own.. It sounds a little hot for us,, and I don’t have cayenne pepper on hand, so I just substituted some mild chili powder for it and put in less paprika. I’m looking forward to tasting it when it’s done(it’s already starting to smell yummy in my kitchen).! I think this will be great as it is , but I also like Rob’s idea of browning the sausage, too. I also added carrots and mushrooms so I won’t have to cook the vegetables later – although my family would love your idea of serving corn on the cob with it..
Hi Rosalie! Creole seasoning is what we use in place of regular salt and pepper. Seasoned salt is also another option. But I like how you made your own, and I love the idea of adding carrots and mushrooms! Thanks for visiting! We had this recipe for dinner tonight, and it was so good! As we are not fans of mushrooms I substituted cream of chicken soup and also added about a cup of water. It was really flavorful and filling, a keeper! That’s awesome Nancy! So glad to hear it! This dish is amazing!! 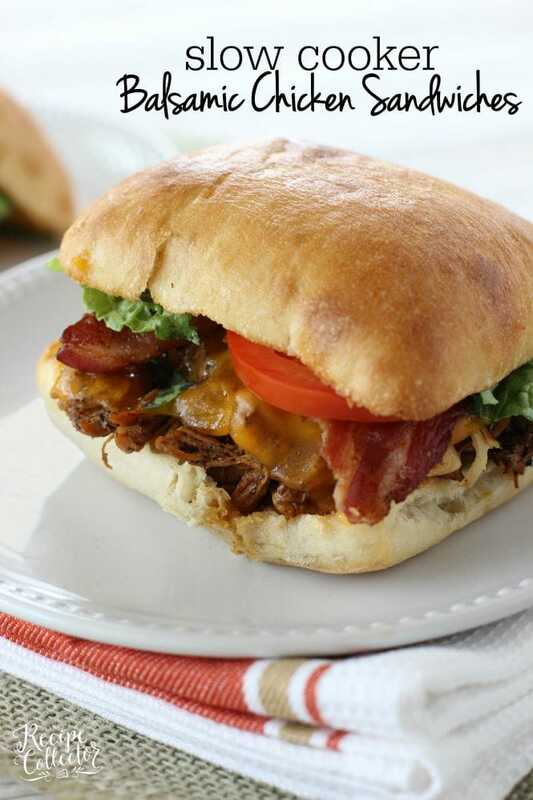 It is so tasty and by far the easiest slow cooker recipe I have seen! We have made it twice now and it has officially become a favourite/regular. It is so perfect for fall! Hi Kaylee! I’m so glad you loved it! Thanks for visiting! I can’t get this to print. What am I doing wrong? Hi Lois! I’m not sure why it won’t print for you. I just tested the “Print” button on the recipe and it worked. Are you using a mobile or on a desktop/laptop? I print from a laptop as well. It works for me. I haven’t had any others mention trouble printing. I know occasionally my old printer (an HP wireless one) would give me trouble printing just about everything depending on the signal strength at that time. I wish I could help more! I made this a week or so ago but I forgot to put in the cream of mushroom soup and it turned out great! Added a little more creole seasoning because we like spicy things. Cooked it in some chicken broth and topped our individual servings with cheese. My family loved it! Guess what’s in the crockpot again tonight! Hi Barbara! So glad to hear you guys liked it, and I love your ideas too!! We love how easy it is too!! Thanks for visiting!! Hi Amanda! I love that you used crab boil! 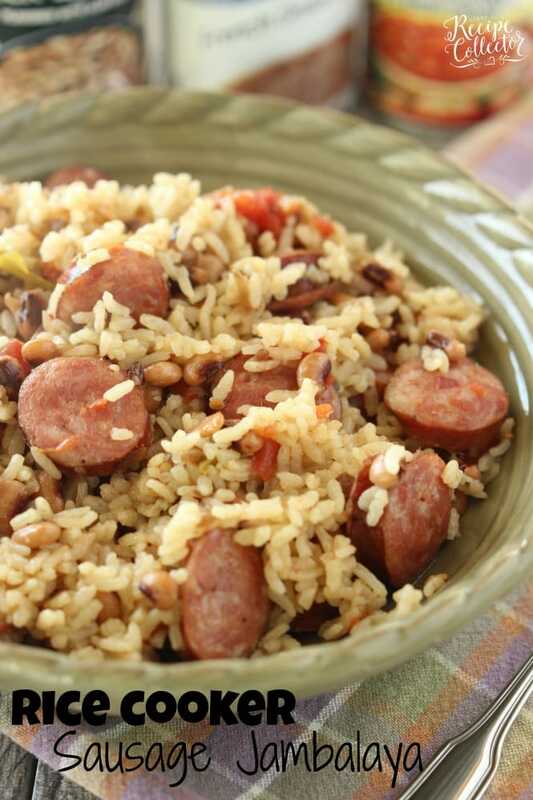 This recipe always reminds me of putting sausage in with our crawfish boil. That’s one of the reasons I make corn on the cob with it! Thanks for visiting! I am physically disabled and only have the use of one hand. Therefore peeling the potatoes is difficult. Is it possible to make this by just cutting up the potatoes but not peeling them? Hi Danielle! It’s fine to leave the skins on! I made this yesterday and wanted to share what I did as I see some have asked about using Italian sausage. So I had Italian sausage and while the flavors were really good, it was way to greasy. So I would make this again and again, but would follow the recipe and use the smoked sausage. I just had them and wanted to use them up. I don’t generally even comment on a recipe if I didn’t follow the original one, but it was asked so I thought I’d tell you my experience. Thanks for sharing Katie! I rarely cook with Italian Sausage, so it is hard to know how it would turn out without making it. can this be cooked on high instead of low? If so, how long should I cook it on high? Hi! You sure can. I would try 4 to 5 hours. Hey Jaren. Thanks for the recipe. Winter’s here and I’ve just dug Slow Cooker out the cupboard. Nice easy meal for me. Glad to hear that Barry! Thanks! I am crazy as I have tens of thousands of recipes already and he would eat hamburger every single day (Yuck). But I love trying new things. It’s never any fun making the same things all the time! I totally agree with you Sandra! Hello! I read through all of the previous posts… And no where can I find any one who asked whether or not you actually make up the condensed soup?… Or just put the can in as is without the water or milk. Hi Anne! It’s just the can of soup. No added water or milk is necessary. Thanks for visiting! I absolutely can’t wait to crock this one! I am usually doing sausage and cabbage. My husband likes it but it stinks up the house. This is a great alternative! Thanks! Hi Crystal! This one is so good! Also, if you like cabbage, try my One Pot Cabbage Casserole recipe. It’s the most popular one on my blog! Can you use cream of chicken as a substitute for the cream of mushroom? Hi Natasha! Yes you sure can! This looks so good, and the recipe is so simple. I love it. I especially love that I have everything I need to make it already in my house. Thanks Patti! That’s always nice!! Jaren! 😀 What part of LA are you from?! I was rummaging Pinterest for DIY Horse Feed-related-stuff & this popped up. Usually I don’t divert from the path I’m on, but the picture looked SO yummy! And then I get to the end & realize why… a fellow Louisiana cook. Haha! Let me just say that I browse Pinterest a lot for many different reasons, interesting recipes residing somewhere near the top of the list, but they have never led me to follow a food blog…until now! I’m excited to try this recipe, and then the alternate version with the cheese soup & Yukon Golds (what?!) and the Cabbage Casserole! Yummo! Hi Brittany! I’m so glad you stopped by and so happy to hear from a fellow Louisiana gal! I’ve lived in Calcasieu Parish my entire life. I hope you enjoy the recipes!! What kind of onion is best for this dish? I hope you say red onion because that’s my favorite. I typically use a yellow onion if I am cooking it. That is just my personal preference. I am sure a red onion would be fine if that is what you prefer. Thanks for visiting! Look at those potatoes bathed in creamy sauce along with juicy sausages! I want to try a little variation with the recipe by adding fresh herbs like basil and cilantro. This 5 ingredient dish is absolutely economical and easy to prepare. Thanks for sharing this lovely. Hope to look at more easy to prepare recipes in your blog. I have made this twice now and it’s amazing!! I use Yukon gold potatoes with the skin on. And I just use cheap smoked sausage or Polish kielbasa whatever is on sale and it’s great. I can’t believe with as easy as it is and such few ingredients that it’s so flavorful. Thanks for sharing this great recipe!! Hi Jessica! So glad to hear you love it too! Any Nutrition Facts on this? I didn’t see anyou. Hi Margie! I typically do not post nutrition facts on my recipes. However, if you have a smartphone with the My Fitness Pal app, you can import any recipe found online into the app and it will calculate it for you. Hope this helps! I’m sorry I did not share in your experience. I have a good friend who makes this dish on the stove all the time because she prefers frying it as well. I think it also depends on the sausage you use. Part of the appeal of a crockpot meal for me is being able to throw it in quickly in the morning before school/work. I usually shy away from crockpot meals that require prep before hand most of the time. What kind of sausage did you use? I’ve just made this for something like the 10th time. It’s a great recipe for experimenting. Today’s mix was smoked kielbasa, left out the onion, added one package onion soup mix and a can of Swanson’s chicken broth, 1/2 bag frozen peas and 1/3 bag frozen baby carrots. I also substituted fingerling potatoes. Hi Brenda!! I love how you mixed things up! It is a great dish to start off with and put in your favorites! Thanks for visiting! This looks yummy! How do you think it would be with the healthier low fat version of the cream of mushroom soup? Hi Kelley! Sorry for the delay. We were on vacation. Yes, I often buy the low fat version for many recipes! Thanks for visiting! Hi Kara! I’ve never had sauerkraut. It’s not something we have down here very often, so I’m not really sure. I usually make this as my main dish with another vegetable. Thanks for visiting! I am so making this this weekend. But no cream of mushroom, I think I’ll use cream of onion. Thank you so so so much for the recipe!! That sounds good too, Laurelei! Thanks for visiting! Do you have to peel the potatoes? Just curious if there’s a reason for it. Thanks! Hi Toria! No, you do not have to peel them. I do that mostly for my kiddos because they tend to be a little picky at times. Have a great day! I found this recipe awhile ago and have been making it at least once a month since. We love it in my house. I typically use cream of mushroom and roasted garlic soup, baby yellow or red potatoes (unpeeled) and beef smoked sausage. Sometimes I add ranch seasoning too. I’m looking for ways to give it a new twist. Any suggestions? Hi Lexi! I’m so glad you like this recipe! I love all your tips too! One other thing you could try is adding some Velveeta and green onions. I worked on that recipe yesterday, and I will post it soon! I just came across this recipe last week and made it today, and it’s a definite keeper! It was absolutely delicious! I read through all the comments and followed a couple suggestions of other posters. I used cream of celery soup and browned the sausage. I put a little bit of olive oil on the potatoes, then salt, pepper, garlic, & Old Bay Steamer (which we always have on hand). We had green beans as our side, which went well with this dish. Definitely keeping this one in the regular rotation! Thank you for sharing! Hi Brandy! That sounds great! Thanks so much for visiting! Hey there! Can’t use cream of mushroom soup because of an allergy, and really not a fan of using cream soups in recipes. Is there anything else I can use instead? Maybe heavy cream? Thanks!! It starts with butter, flour, and chicken broth. It’s similar to a cream of chicken. This sounds so yummy but being diabetic the potatoes are a no no. Has anyone substituted cauliflower? Hi Nickie! I’m not sure how cauliflower would hold up in the slow cooker. But I do think that would be good cooked on the stove! I’m needing to use up things out of my freezer, and I have frozen diced hashbrowns. Do you think those would work, or do you think they would end up too mushy? I’m not sure how they would turn out, and I would think they might get mushy. I would reduce the cooking time if you decide to try it. Thanks for visiting Carly! Do you have a waffle iron? Mix up a “batter” from the hash browns, eggs and crumbled bacon, ham or sausage. Spray the waffle iron with cooking spray and cook them pretty much the same way you’d cook a waffle — maybe 30-60 seconds longer. Top with sour cream if you want. Excellent suggestions here. I needed a dish for a work pot luck but no time for kitchen duty. That meant crock pot time. I was craving curry, so I added it. I loved this recipe but more so the entire staff did too. Thanks for sharing. I love bringing a dish that everyone loves! Thanks for sharing!! Hope you loved it Shay! Thanks for visiting! Have this in the Crock-Pot right now , I am so excited to try it !!! All the ingredients smell so good together !!! Awesome Melanie! Thanks for visiting, and I hope you enjoyed it! Do you think that this would work with skinless sausage? Yes I do think it would work! Thanks for visiting! In the crockpot cooking now on a cold Northern California morning! Hope we can wait until dinner time before digging in…husband and I both have bad colds and this sounds like comfort food at it’s finest! Thanks for sharing! Awesome Sarah! So glad you tried it!! Thanks for visiting and Happy New Year! LOVE using my crockpot for an easy meal! Always looking for a new slow cooker meal, thanks! I made this a few weeks back, shortly after Christmas. It was delicious, and so I am making it again today. The only thing differently that I am doing today is cutting the potato amount from 2.5 lbs down to 2 lbs because, for me personally, I felt there were a little too many potatoes in the dish the first time I made it. But that’s just me. As for the taste….just delicious, and I made this one a keeper! Hi Sherri! I’m so glad this recipe is a keeper for you! It’s definitely comfort food that I can’t wait to eat when I make it! Have a great day! I made this dish today while we were out all afternoon at a sports event for my son. It was so delicious and yes the house smelled amazing! So simple to put together. Next time I would add another potato or two. Thank you for sharing! Hi Michelle! So glad you liked it! Thanks for visiting!! Has any one tried making this with hash browns? I’m thinking about doing those bulk crock-pot dinners where you prep everything, throw it in a freezer bag and freeze it. I’m thinking I could freeze the sausage, soup, onions and seasoning… then dump that in with a bag of frozen hash browns. Hi Brenda! I love those dinners that you prep ahead of time too. But honestly, this meal is so simple to throw together in the morning. And I love the idea of hash browns. I think it would totally work, but you may want to reduce the cooking time if not using chopped potatoes. Hi Jaren, can I cook my sausage before I add it in the crockpot? People have commented that they did that, but it really isn’t necessary. I use a smoked pork sausage, and it turns out great. Hi i am cooking this now. And live I sc, so i used hillshire sauage i saw where you mentioned not to use that kind. Will it still turn out ok? Thanks. Hi Tara! People have commented on using several different kinds of sausage in this recipe over the years. It really boils down to a personal preference and how much of a smoked flavor you prefer. How did it turn out? Hello, our family has to be gluten free and dairy free for a substitute of the cream of mushroom soup can you use onion soup mix and how much water would you use? Hi Mindy! I don’t use onion soup mix very often, so I’m not exactly sure on how much water to add. This recipe does not require a lot of water either. I would try adding a cup of water and skip any other seasonings and onions in the original recipe. Has anyone tried this in a pressure cooker? I love my slow cooker but I always forget to plan ahead and put it in during the day haha. I would love to try this as a pressure cooker recipe but figured I would check and see first! Hi Garnet! I have not tried it yet! But it is on my to do list soon, and I will update the recipe. Thanks for visiting! Hi! I really want to try this recipe, but I have a serious, it lastly unheard of, intolerance to (most) smoked meat (actually just hickory/hardwood smoked meats as I’m very allergic to hickory trees). Is there another meat I can substitute for it? Thank you for any help you can provide! Hi Deni! The only other thing I could think would be ham if you can have that. I’ve done it with Italian sausage (sweet or hot) and spices and it came out great. Thank you both for replying. Brenda: did you use the same apices in the recipe or different ones? @Deni: I’ve done is with spaghetti seasoning and my own mix of oregano, basil, rosemary & thyme. It turns out super if you brush the sausages with OO, roast and brown them in a separate pan while the potatoes are cooking. Then cut them up, throw them in and let the whole thing cook for the remaining time. Threw this in the crockpot today…came home from my son’s football practice to a fantastic meal! Glad I stumbled upon this recipe! It will become a standard in our house for sure. 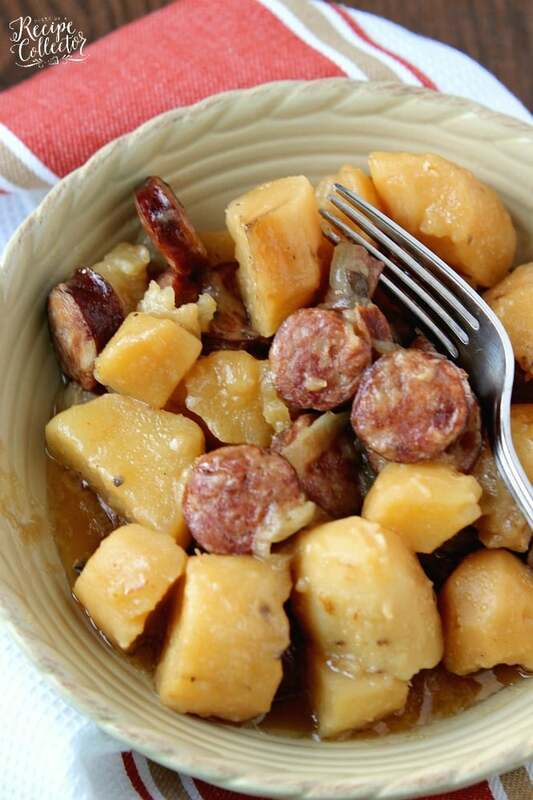 We ALWAYS have deer sausage on hand, and we grow fresh potatoes as well. Easy enough that my kids (8 & 12) prepped it. I’m thinking I might throw in green beans next time, or maybe carrots., just to have a veggie. Thanks for the recipe! Hi Alicia!! I’m so glad to hear you guys liked it! Thanks for visiting and letting me know!!! Have done this 10 different ways and it comes out great every time. Last weekend’s experiment was fingerling potatoes, chourico, onions, peppers and Portuguese “allspice” (cumin, paprika, allspice, chili powder, oregano and a touch of cinnamon). It was awesome! Love that Brenda!! Thanks for sharing! Made this tonight, OMG it was sooo good! We all had seconds! Didn’t have creole seasoning so I used seasoned salt and rosemary, garlic & sage blend seasonings! Served it with corn and biscuits! Thank you for a very easy, cheap, delicious meal! Awesome to hear Audrey! Thanks for visiting!
. The house smells wonderful, and it came out great! I have enough for 2 or 3 more meals. I did try it once before, but the sausages turned out horribly. Don’t use the Brown & Serve ones! Next time I make this, I want to add green beans & carrots, make it more like a stew. Thanks for a great recipe! Hi Randi! So glad you liked the recipe!! I used precooked keilbasa and russet potatoes and it turned out AMAZING! This will be a new favorite in our household. Hi Kelly! So glad you liked it! Thanks for visiting! How many servings does this make? I have a family of 7 and wasn’t sure how much I need to make. Hi Destiny! I would double the recipe for a family of 7. Thanks for visiting! Excellent recipe for busy days and picky-ish kids!! I added some hatch green chilies, jalapenos and lighter potatoes… Oh my!! Amazing just the way you make it as well!! Thank you! Love the jalapeno and chilies! My husband would totally love that! Anyone try this with sweet potatoes? This looks so good. I’m trying it tomorrow. I’m using kielbasa. Do I cut it up before putting it in the crockpot or wait until after? Also I couldn’t find you on Instagram. I made this tonight. I didn’t plan ahead so I ended up making it in the oven in a Dutch oven. I added a can of cream of chicken/mushroom and a can of water. Total cooking time was about an hour. It turned out perfect and my family loved it. Hi Jennifer! So glad y’all liked it! Thanks for letting me know!! If I use red russet potatoes, do I have to peel them? Or can I leave the skin on? Hi Lyndsay! That’s a personal preference. You can totally leave them on. I peel them because I have picky kids at times. Thanks for visiting!